Considering how common moths are, it’s likely that you’ve had numerous run-ins with the insects – whether it’s from spotting a rogue one flying around your home’s interior lights or getting one caught in your hair or clothes. The pests may seem harmless, but they can be a major nuisance due to their feeding habits and the way that their offspring develop. 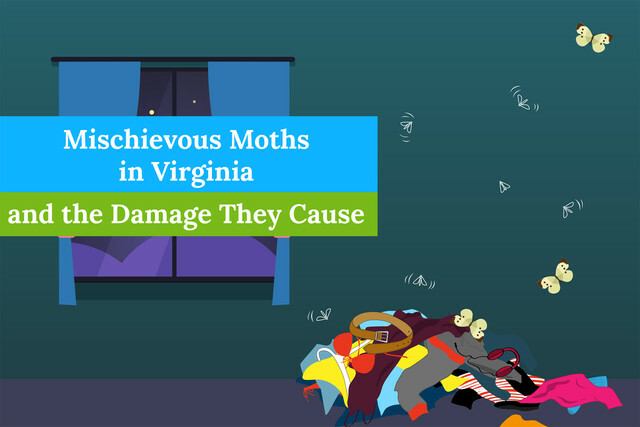 This is an infestation that may require professional assistance, so if you suspect that the insects have invaded your home in Virginia, it’s time to take action. Moths have two pairs of wings that are covered in scales. These insects also have large compound eyes (multiple units that make up one big eye) as well as a long and flexible mouth part called the proboscis. The pests vary greatly in size and appearance depending on the species. If you travel to faraway places like Europe or Madagascar, you may come into contact with the pretty ones that have brightly colored wings. 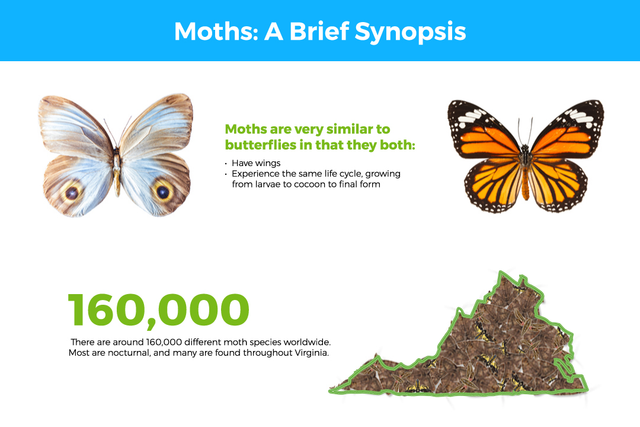 Across Virginia, the most popular moth types include the brown house moth, common clothes moth, the Indian meal moth, and the oak processionary moth. Brown House Moth: The brown house moth eats by scavenging for food. This species enjoys a varied diet that ranges from dog biscuits to cereals and grains. Like other moths, they tend to fly around your home during the evening hours. They also like to hide in low areas like your baseboards. Common Clothes Moth: The common clothes moth is small and light colored. You may be more likely to see it crawling on your floor than flying around your light bulbs. The larvae of this species prefer to eat fabrics, and they often spin webs. An adult moth of this type measures from 6 mm to 8 mm long, and it has a slender, yellow body. This is the pest that will eat your wool sweater or favorite cotton slacks. It also dines on other types of cloth material. Indian Meal Moth: As one of the most destructive moths, the Indian meal moth is a pest that you should try to keep out of your home. Its wings are a combination of pale grey and rusty bronze. This moth species is responsible for the majority of the insect problems within the natural food industry. If they infest your home, then they’ll probably be attracted to any cereal or grains that you have stored in your pantry. Oak Processionary Moth: The oak processionary moth species is an especially invasive one. If you run into one of these pests, it won’t harm you, but the caterpillars have hair-like appendages that are venomous, and these appendages stay toxic for years after they fall off the caterpillar. While this venom won’t cause major health issues, it can cause severe skin irritation, swelling, and redness. Moth larvae are capable of causing significant and expensive damage to your clothing. In most cases, the pest will put holes in your clothes, but when you’re dealing with a large-scale infestation, the pests can completely destroy clothing items by chewing them up beyond recognition. If you have to replace numerous clothing items, then the cost could be extensive. They can also be expensive for businesses who process or serve food, damaging large containers of food and harming reputations when word of their presence gets out. An even bigger problem with moths is that they can infest your home without your noticing. When this happens, the infestation can cause substantial damage. That’s why it’s so important to be proactive in spotting infestation. Moth infestation signs range from coming across damage caused by feeding to webbing or actual cocoons. Look for droppings or pupae in drawers, along walls, or on the corners of cabinets. With a moth infestation, you’ll want to be thorough, so wash fabric items, curtains, towels, and any soft furnishings that you may have. Moth larvae enjoy eating these fabrics as much as they do clothes. Washing them will get rid of any larvae that might be hanging out. If the pests are in your home’s food areas like your pantry or cupboards, then wipe down pantry shelves, the inside of the cupboards, and kitchen drawers. Be sure to clean tiny cracks and crevices because moth eggs like to hide in these small spaces. If you store suitcases, travel bags, or other containers in areas of your home that has a moth infestation, then clean the inside of them as well. Infestations in areas that you’re unable to clean are best handled by a professional pest control company. Our experts at Connor’s Pest Control will back up the steps that you’ve already taken to ensure that your moth infestation is gone for good. Prevention involves keeping things clean and clutter-free. Establish a consistent routine of cleaning your closets, drawers, pantry, and cupboards. Some moth species are attracted to food, so keep your food sealed and stored. Don’t leave open cereal boxes out on your counters. Vacuum regularly and empty the bag to get rid of any moth larvae. Also, clean your clothes frequently – even the sweaters and jackets that you haven’t worn in a while. 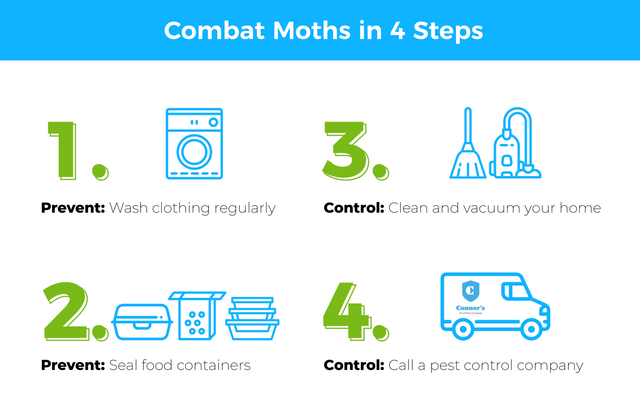 Pest infestations are a major inconvenience, and while a moth one isn’t typically dangerous, it can be expensive and annoying. The last thing you want is a moth flying in your face – or worse, eating your food or clothes. For strategic treatment of moth infestations throughout Virginia, contact Connor’s Pest Control. We’ll make sure they’re gone for good with products that target them at every stage of their life cycle.